I found myself writing this email to some collaborators, but halfway through realized that it’d be nice to get EVERYBODY’s input. Probably, one of you is going to review my next paper, so how awesome would it be for you to just tell me what you think now, and make both of our lives easier later. To test whether taxa vary significantly across groups of samples, we first need to filter the OTU table to get rid of OTUs that are not present in most of the samples and/or that do not vary across samples. This must happen for statistical reasons. A third option would be to apply both criteria. My inclination would be to go with the third option, but mostly because I want to limit as much as possible the number of hypothesis tests that we do in order to avoid draconian p-value corrections. I’m not a big fan of arbitrary thresholds, but they are so frequently required that I’ve made my peace with them. However, if someone can suggest a non-arbitrary threshold, that’d be great. But mostly, I want to make sure that everyone agrees now on the method that we use so that I only have to do this once. Thoughts? This leads me to the following question – do we need some sort of naming guidelines or regulations for computer software? We have all sorts of naming regulations and conventions for genes, for species, for other groups of taxa, and more. Why not software tools? But seriously, I don’t think we need such a thing – we just need people to use Google and to do a little searching before they invent / publish a software package in case it’s name is, well, already used. Author Jonathan EisenPosted on April 22, 2013 Categories Misc.Tags Bellerophon, Bioinformatics, Misc., naming software7 Comments on Do we need naming regulations for computer software? The Bioinformatics Fellow position will be a 1-2 year term. Help develop a strategy and the implementation plans for cyberinfrastructures related to MMI activities. Communicate with the research community, other funders, commercial vendors, and others to prepare a needs analysis for cyberinfrastructure that includes a description of ongoing or past activities and existing infrastructure. Convene meetings and workshops in cooperation with grantees and other funders as necessary. Maintain solid knowledge of the field and key emerging trends. Contribute effectively on a variety of Program- and Foundation-wide issues beyond the Initiative as required. A Doctorate degree in environmental microbiology, bioinformatics, biology or other relevant field. Demonstrated knowledge and/or experience with computing environments and sequencing technologies. Demonstrated experience with using bioinformatics tools. Good communications skills including demonstrated writing skills. Demonstrated knowledge of the bioinformatics community and/or existing cyberinfrastructure that supports environmental science. A desire to promote and work on a complex partnership and multi-stakeholder project to achieve tangible outcomes. Ability to synthesize diverse points of view to develop solutions. Demonstrated strong teamwork and interpersonal skills, with ability to develop productive relationships with colleagues, grantees, and stakeholders. Collegial and energetic working style. Demonstrated ability and openness to quickly adapt and adjust strategy and approach to changing conditions. Ability and interest in traveling to grantee meetings, site visits, and national/international conferences. As nth generation DNA sequencing technology moves out of the research lab and closer to the diagnostician’s desktop, the process bottleneck will quickly become information processing. The Defense Threat Reduction Agency (DTRA) and the Department of Defense are interested in averting this logjam by fostering the development of new diagnostic algorithms capable of processing sequence data rapidly in a realistic, moderate-to-low resource setting. With this goal in mind, DTRA is sponsoring an algorithm development challenge. Author Jonathan EisenPosted on December 8, 2012 Categories Misc.Tags Bioinformatics, DTRA, metagenomics, Misc., prize1 Comment on Attention all metagenomicists: put your pinky in the corner of your mouth & say "1 million dollars"
Our recent paper presents CHANCE a user-friendly software for ChIP-seq QC and protocol optimization. Our user-friendly graphical software quickly estimates the strength and quality of immunoprecipitations, identifies biases, compares the user’s data with ENCODE’s large collection of published datasets, performs multi-sample normalization, checks against qPCR-validated control regions, and produces publication ready graphical reports. CHANCE can be downloaded here. A typical IP enrichment report. CHANCE cross-validates enrichment with previous ChIP-qPCR results. 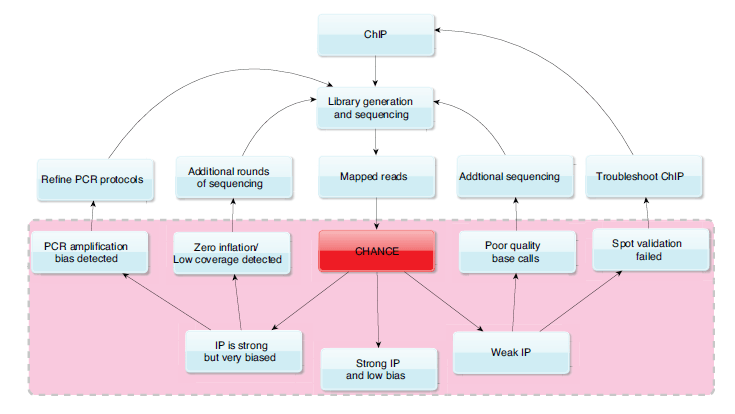 Experimentalists frequently use ChIP-qPCR to check the enrichment of positive control regions and the background level of negative control regions in their IP DNA relative to Input DNA. It is thus important to verify whether those select regions originally checked with PCR are captured correctly in the sequencing data. 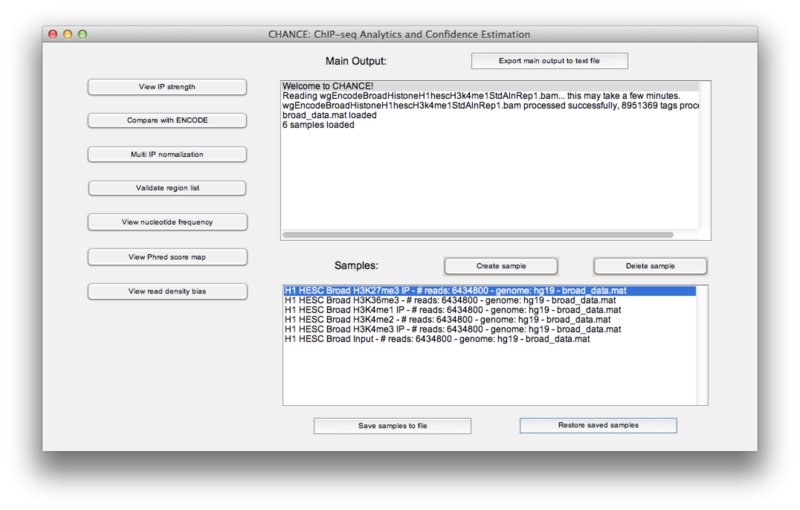 CHANCE’s spot-validation tool provides a fast way to perform this verification. 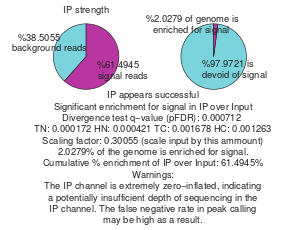 CHANCE also compares enrichment in the user’s experiment with enrichment in a large collection of experiments from public ChIP-seq databases. CHANCE has a user friendly graphical interface. How CHANCE might be used to provide feedback on protocol optimization. I posted a question to Twitter and Facebook about metrics for assessing density in a phylogenetic tree. Here is a “Storification” of the responses. Thanks for the help all. Yet another post in my “draft blog post cleanup” series. Here is #11 from September. Just a quick one. In August a nice review paper came out on phylogenetic analysis software: Learning to Become a Tree Hugger | The Scientist. By Amy Maxmen it is a “A guide to free software for constructing and assessing species relationships”. Definitely worth checking out.